Dream big when selecting a new floor by decorating with vinyl flooring. This popular flooring option provides possibilities like never before. Choose bold hues or complementary colors to match your existing décor. In addition, vinyl now is manufactured to look like natural wood, stone, or tile. From classic styles to modern designs for your home or business, the choice is all yours. Come to our flooring showroom to browse hundreds of selections. We have flooring professionals on hand with a wealth of knowledge and excellent recommendations that take your preferences and budget into consideration. In addition, after you choose your flooring type, you can also use us for vinyl flooring installation. Busy households need vinyl flooring because it offers high performance and low maintenance. Due to its durability, vinyl floors are perfect for families with children and pets. It stands up under the toughest conditions: running, rough-housing, and playtime. Vinyl flooring is made to resist scratches and scuffs, as well as stains. At the same time, clean-up is a breeze. Just dry-mop to remove dirt and damp-mop occasionally. Vinyl is the no-fuss flooring solution that everyone loves. For the rich beauty of wood with easy installation and maintenance, choose a vinyl plank floor. This flooring mimics hardwood, but is easier on your budget. Vinyl plank locks together and installs right over your sub-floor. Our vinyl flooring installation technicians ensure to prep the space perfectly before we begin. We come to your home and correctly install the vinyl floor of your choosing. We make sure it lays flat and smooth and lasts a long time – through the everyday hustle and bustle of life. 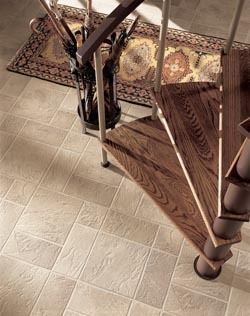 Add elegance to your home with luxury vinyl tile flooring that has the look of natural stone or tile. Such classic beauty increases the appeal and value of your home. Plus, it’s comfortable underfoot. With all of these advantages, vinyl flooring is the fashionable, affordable, and durable choice for home and business owners. Different types of vinyl require various methods of installation. Vinyl sheets come in 6-inch and 12-inch widths. They snap together for a precise fit. Luxury vinyl tile (LVT) comes in squares just like tile. With the professional floor installers at our flooring store, you do not have to worry about the installation process. We take care of everything for you and offer our services at affordable rates. Contact us to find out more about decorating your home with vinyl flooring. We proudly serve the communities of Little Rock, North Little Rock, Benton, Maumelle, Conway, Hot Springs and Searcy, Arkansas.